The Chicago Center for Music Education (ChiME) is committed to bringing its programs to organizations that value music education and its impact on students. ChiME’s classes break down barriers of race, culture, and economics through the universal language of music. Develop a high level of musical literacy, knowledge, skill, and music appreciation in students of all ages. Establish a strong foundation in music in the areas of beat, rhythm, and melody. Provide engaging, hands-on, age-appropriate activities that inspire and motivate students. Create an awareness in students of social emotional skills and character development. Offer meaningful and community-building performance experiences. Important to the success of the program is the collaboration between ChiME’s teaching artist and the classroom teachers. Our partnership empowers teachers to use our tools between weekly ChiME lessons. 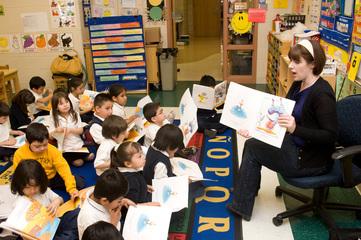 Teachers are encouraged to stay in the classroom for the duration of the music class. Using music as a tool to more actively and consistently engage students enhances learning, particularly those with dissimilar learning styles who may be more responsive to the arts. To ensure ChiME is meeting its goal of providing the best music education possible, students are assessed on musical learning three times per year, resulting in a baseline, mid-year, and summative understanding of the impact of our programs. Assessment results provide ChiME teaching artists with an understanding of program strengths and needs, ensure alignment with each classroom’s academic objectives, and inform future program goals and learning outcomes. Along with these curricula, we also offer a curriculum designed for Early Childhood and for children with special needs (Music Therapy). Programs occur weekly over the course of the entire year, and the academic calendar can be tailored to the needs of each partnering organization. Class length varies from 30 to 45 minutes, depending on the needs and objectives of each partner organization. ​​For more information call us at 312.738.2646 or email gbagley@chimemusic.org. Clap, Sing and READ! is a literacy-based music program, designed to develop musical skills such as rhythm, beat, melody, and instrument play, while also enhancing literacy skills for children in Kindergarten through 2nd grade. The progressive curriculum is divided into six age-appropriate book units over the course of the year, with each book introducing new ideas and reinforcing previously learned musical and literacy concepts. The teaching artist brings the book to life through songs, movement, instrument play, visual aids and storytelling, and, at the end of each of the six units, the child receives a copy of the unit’s book to add to their home library. Student's musical skills are assessed three times per year, and our teaching artists work with classroom teachers to develop lesson plans focused on specific areas of literacy development. Classes meet one time per week for 30 or 45 minutes. Class day(s) and times are consistent from week to week and scheduled with each partner school prior to the start of the contracted school year. ChiME’s Musicianship curriculum for schools, organizations, and community groups focuses on developing a solid foundation of musical skills, such as rhythm, beat, melody, instrument play, and improvisation. Gradual and sequential mastery of these skills and musical knowledge leads to musical literacy (ability to read and write music) and music appreciation. Learning objectives are achieved through the use of hands-on, experience-based activities that engage and motivate students while helping them discover and practice musical ways for self-expression. 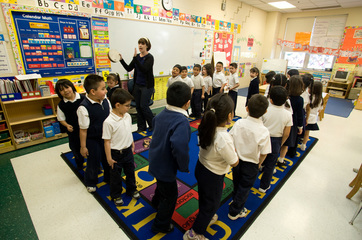 Classroom activities take place in a circle. 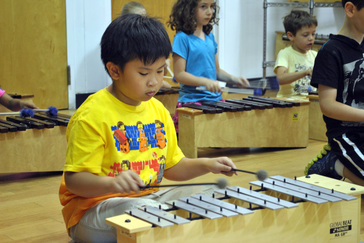 Students sing, play hand-held percussion instruments, and use movement to internalize musical concepts and make connections. Essential life skills and character traits are developed throughout the process, including the ability to be proactive, plan, stay disciplined, think critically and creatively, persevere, solve problems, and act with empathy towards others. Performance is an integral component of this curriculum; it deepens the experience and represents partner organizations in their communities. ChiME’s teaching artists partner with classroom teachers to create music activities that align with the classroom's academic curricula to help create greater connections to subject matter. Student's musical skills are assessed three times per year. Students in grades 3-8 continue to build on the musical foundation established in earlier grades through a lens of performance preparation in an ensemble setting. Through the practice and mastery of carefully chosen repertoire students delve deeper into more complicated musical concepts, including meter, harmony, and form. The chosen repertoire is engaging, meaningful, and relevant to students’ experience, age, and ethnic or cultural background. Instrumentation includes, but is not limited to xylophones, percussion instruments, voices, and ukulele. Students learn the language of music with the expanded use of written musical notation. Learning objectives also include music history and theory and encompass a variety of musical styles and cultural influences. Each classroom is provided with performance opportunities throughout the year. ChiME’s teaching artists partner with classroom teachers to ensure alignment of presented concepts and competencies to the overall academic and social-emotional goals of each classroom. Students continue to work on the development of character and essential life skills. Student's musical skills are assessed three times per year.